I was never super into pizza. I know! I know, it's ridiculous! Take comfort in knowing that I have converted! Turns out, I was eating the wrong kind of pizza. When I moved to NY I learned-I love thin crust! But still, pizza wasn't a thing I ate very often-so unhealthy! Then, I realized how easy it was to make homemade pizza. But still, I was nervous to try homemade dough. This is my go-to pizza dough recipe. 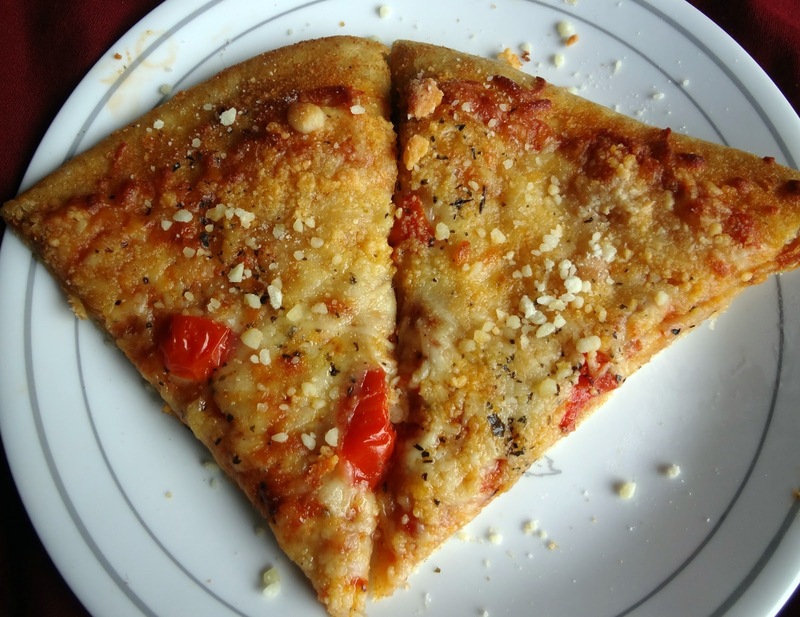 Not only does it make delicious, thin crust pizza-but it's also made with whole wheat flour! Yay for it being healthier! During Lent I made this virtually every Friday. I'm dating a bottomless hole. Adapted from Cheeky Kitchen's "Crackerbread Pizza"
Add all-purpose flour until a ball forms (I imagine this is easier with a dough hook, but using your hands will also do the job). Then, add a handful of AP flour at a time until the dough is soft and kneadable, no longer sticky, but not stiff. Knead until it forms an elastic ball. Pour the olive oil atop the dough. Cover with a rag and let rise in a warm place for 1 hour. Separate the risen dough into 2 balls, and wrap each ball securely with plastic wrap or parchment paper (you may want to double up, as the dough may still continue to try to rise). Store in the refrigerator for at least an hour. You can also freeze the dough. Before baking, allow the dough to sit at room temperature for 30 minutes. 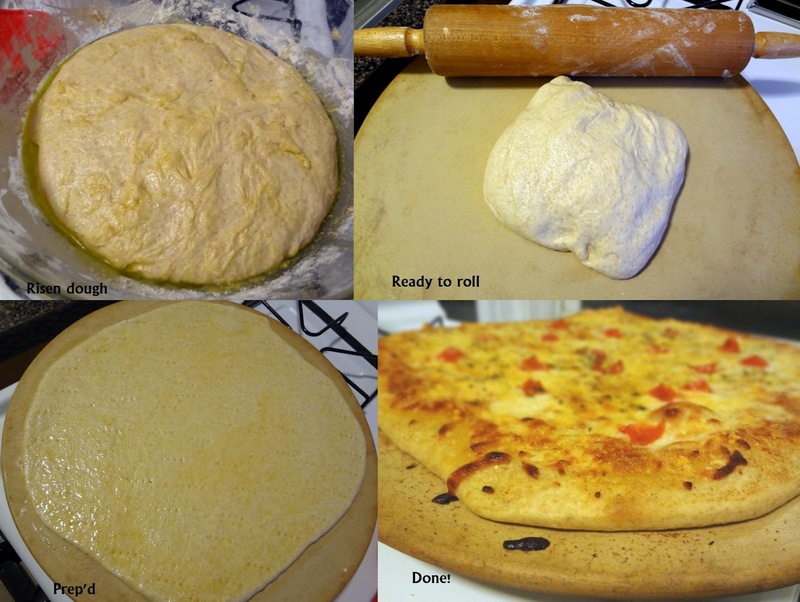 When ready, roll out into a pizza with a rolling pin (I like it to be rather thin). Pierce the rolled out dough with a fork to prevent air bubbles. Optional: mix olive oil and garlic powder together. Brush on the pizza dough. Top as desired. I like to spread a little sauce, then some mozzarella. Sometimes I also put cut up cherry tomatoes on top. I've also added chicken before, for Michael. I then sprinkle a little dried basil on top. I also like to sprinkle garlic powder on the outside crust edges. 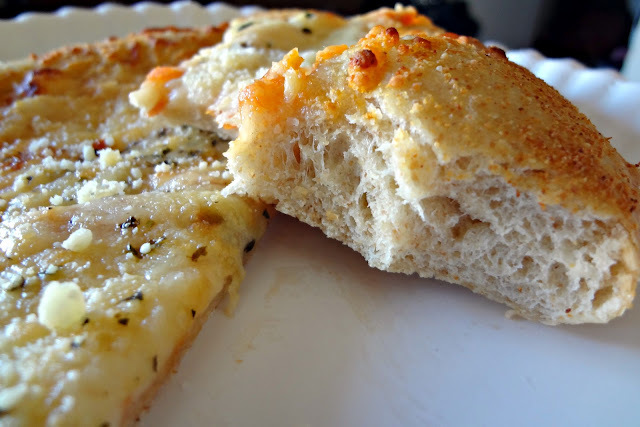 Bake in an oven preheated to 450 degrees until the crust is browning and cheese is bubbling. About 15-18 minutes. There is nothing in the world like NY pizza. That being said, I may have to move in so I can get some of THIS pizza AND NY pizza...every day. This pizza does look pretty amazing, especially that close up. I truly think I would choose pizza as my last meal! Ha-looks like Micheal is not ashamed of his love for pizza either. Enjoy the weekend! Wow!! Look at those air bubbles in that crust. I can just imagine how good that is. Do you deliver? Or can you send me some dough and I'll cook it up on my Egg. Nicely done, bookmarked and will try soon. Lol, if only! Thank you so much, it really is my fave! That photo of your boyfriend with the pizza is hilarious. Pizza isn't my favorite food, either--it's got to be good enough to be worth the calories. Your whole-wheat version looks worth it for sure! Ohh I don't like pizza much either! When I was little I HATED it, then as a teenager--as teenagers are wont to do--I ate entirely too much of it, and now with my recent surgery and digestive issues, greasy pizza is just out of the question. However, a mild, white pizza or pesto pizza with fresh ingredients seems to be okay. This looks mild enough that I could probably do it, and whole wheat--all the better! Yes!! And you can absolutely use whatever toppings you want! Wow! My mom just informed me that we should make pizza for dinner and this is the perfect recipe! I am so glad that I found it!! Thanks! Oooh happy to find this recipe. I'm constantly searching for a favourite whole wheat pizza base.